slick4591 wrote: Taken years ago and it popped up on FB this morning. used to see lots of those or something very similar, along rr track row's. I haven't seen any in a very long time..
You probably were seeing maypops, GB. Google images of maypops and you'll see what I mean. Looks like the same flower. Never heard them called a maypop before. 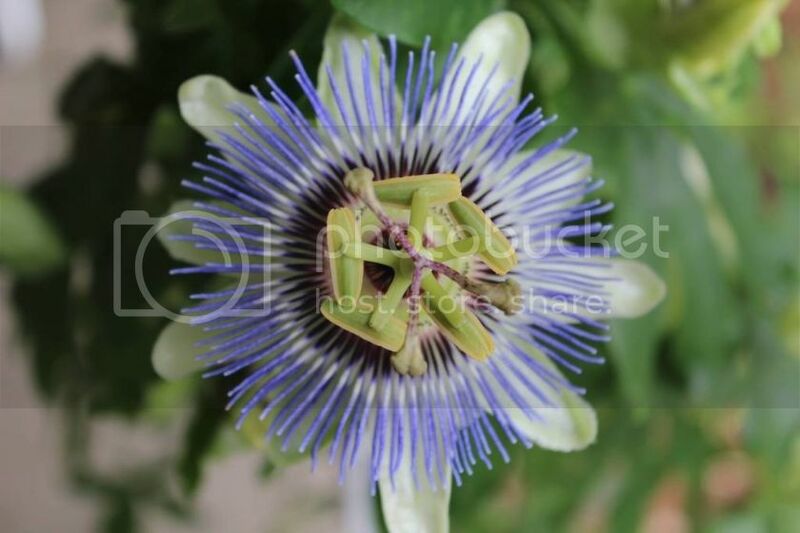 "Passiflora, known also as the passion flowers or passion vines, is a genus of about 550 species of flowering plants, the type genus of the family Passifloraceae." Maypops are just one of the 550 species of passion flower. They grow wild all over the place here. When I was a youngin we'd pick the maypops and throw at each other. They're about the same size as a chicken egg. They taste about the same as a green watermelon. ga.prime wrote: You probably were seeing maypops, GB. Google images of maypops and you'll see what I mean. You're probably right!! I remember the little lemon looking 'fruit' making that popping noise when you stepped on it. But, the color is wrong in the pics I saw. The petals were almost white, not blue or deep purple. Different soil may have made different color flowers? I think the ones that grow here also have white petals, but there could be variations in color hue resulting from various factors (especially pH) I'm sure. I haven't seen one here blooming yet but I'll post a pic when I see one. 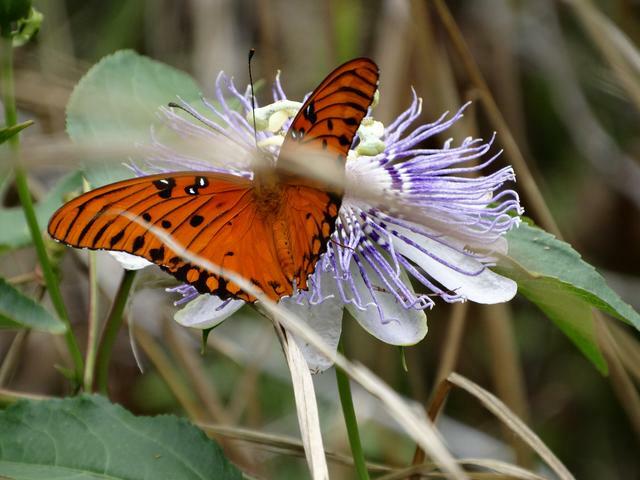 Interestingly, the maypop vine is a preferred food of gulf fritillary butterfly caterpillars. The caterpillars are mostly orange just like the butterflies. The gulf fritillary butterfly is sometimes called the passion butterfly. I'll try and get a pic of the caterpillar on one of the vines, it's a very common sight. 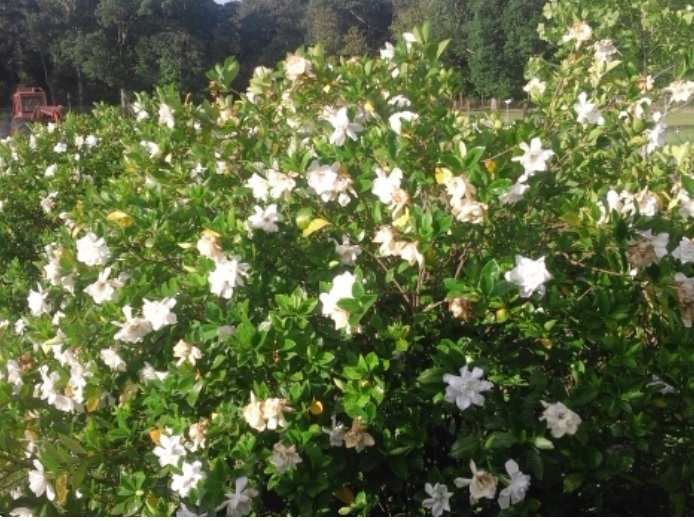 The fragrance of Gardenias is here now. Maypop vine with gulf fritillary butterfly. The petals are white under the purple fringe. Shouldn't be long before the caterpillars arrive. Are the caterpillars good fish bait GA? greybeard wrote: Are the caterpillars good fish bait GA? I don't remember ever trying any as bait, but they probably are good. We always caught and used catalpa worms for bait and still do. Catalpa worms stay on your hook a lot better than crickets. Yep, and catalpas don't crawl up the line and perch themselves up on top of your bobber either like I've had crickets do..
Got lots of the trees around here, but been a long time since I've seen any with catapla worms on any. I used to see them loaded and just knocked them down with a stick. They go high $ (frozen) at a bait shop here. About $6/dozen last place I saw them. I do know the worms don't come out till after the tree flowers so it's still too early for them here. Wow, a kid could make some pretty good money catching and selling them at those prices. Like you say they're easy to catch, just take a pole and hit a limb so it shakes the leaves and they'll fall right off. They are great bait though, you can use the same one to catch several fish before they get too far gone to be usable. ga.prime wrote: Wow, a kid could make some pretty good money catching and selling them at those prices. Like you say they're easy to catch, just take a pole and hit a limb so it shakes the leaves and they'll fall right off. They are great bait though, you can use the same one to catch several fish before they get too far gone to be usable.